We all know where the self-proclaimed happiest place on Earth is, right? It’s smack dab in the middle of Florida, in Orlando to be precise. Therein lies the key to a having a successful childhood: Disney World – the behemoth theme park / marketing machine known round the world. And I went there for Memorial Day weekend – what was I thinking? Well, let me lay it out for you. My boyfriend, Sean and I wanted to get away from Atlanta for Memorial Day weekend. Even though he travels to plenty of exotic locales for work, he was always working then and robbed of the opportunity to enjoy a lot of what comes when you go out of town on vacation. But why Orlando?, you may ask. Why on Memorial Day weekend when it’s destined to be even more overrun than normal? Because we had the inside track. Am I in China again? Nope, just Epcot. Two of Sean’s best friends live in Celebration, FL – the property that used to be owned by Disney, which is located a ten-minute drive from the magic that is Disney. Not only do they live there, they run an awesome business called, Raw Threads, that makes eco-friendly clothes for marathon runners with the cutest Disney-inspired designs mostly for Disney marathons. 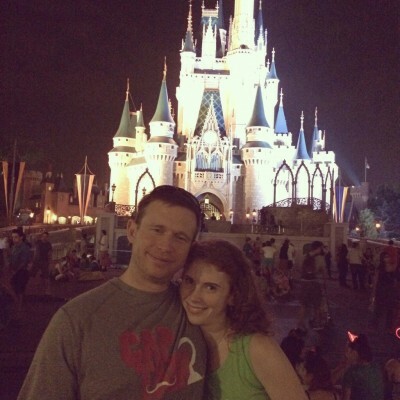 In short, Terry and his wife Jen know all of the Disney parks like the back of their hands – where to go, what to do, what to see, what to skip – the whole nine yards. Plus, it had been over a year since the last time we’d seen them, so when it turned out they’d be in town that weekend, we rented a car and were on our way to Disney. Surprisingly, both the drive down and back from Atlanta was relatively uneventful. We left early Friday morning and encountered almost no traffic the whole 450+ mile drive. It took just over seven hours with a couple of pit stops for gas and snacks, and by 2 PM we were driving into Celebration headed for the new showroom for Raw Threads that they’d just opened about a month prior where they were with their staff (two girls in operations and one IT guy). The back of one of Jenn’s awesome Raw Threads designs. Tinkerbell-inspired wings! Love it! Terry gave us the grand tour of the place (which already looks amazing in my opinion, Jenny’s designs are so great), and then directed us back to their house, just a five-minute drive from the office, where we could unpack our suitcases. The showroom was due to close at 5 PM, and after that we could get our tickets for the Disney parks and begin the magical experience. Right before we left, they told us since it was a holiday weekend, Disney was being especially Disney-rific and playing up their heroes and villains angle, so Sean and I needed appropriate clothes, which Raw Threads happened to have en masse. 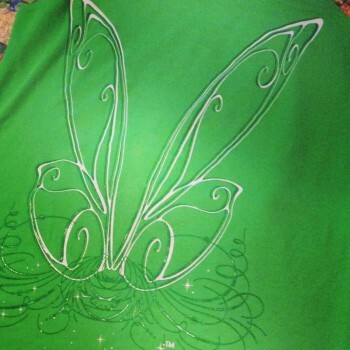 I ended up choosing a bright green Tinkerbell-themed top complete with the word “Fly” on the front and wings on the back, which I absolutely adore, and to complement me, Sean rocked a Captain Hook-themed t-shirt. So cool! Once Jenny and Terry came back from the office later that evening we all headed over to Epcot first, since they’d made dinner reservations at the German Biergarten for us plus their two employees Andrea and Kate, at 7:30 PM. With a little help from Jenny and Photoshop, Sean and I were able to show we were ‘new residents’ of Florida and get the discounted resident rate for three days of Disney fun. 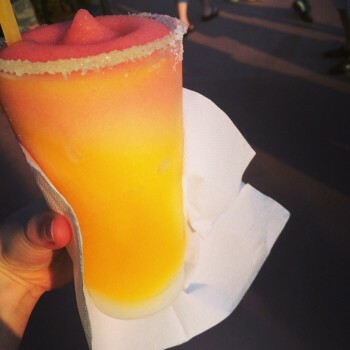 Seriously the best frozen margarita I’ve ever had. Thanks Disney! It was still pretty smokingly hot (a trend that persisted for most of the weekend), but we persevered, rode a couple of rides, cooled down with a refreshing Fiesta margarita from a cart near the country of Spain and then assembled at the Biergarten to wait for our table. A very authentic-looking German girl seated us and turned us loose on the best German buffet I’ve ever beheld. It had schnitzel and wursts, potato salads, pretzel breads, apple tarts and a whole slew of other goodies unique to Germany. During the course of the meal we even had the pleasure of a German oom-pa-pa band playing for us on the main stage. I wished I had more room in my stomach because everything was so tasty there. We practically rolled out the doors just in time to see the fireworks at Epcot, and then hopped on a monorail to go over and see the Magic Kingdom. Since it was Memorial Day weekend, the Disney parks were staying open much later than usual, and Friday night, the Magic Kingdom was staying open all the way until 6:30 AM. Wow! I knew I wasn’t going to be able to make it that long, but it was great that we could still go over and not worry about it shutting down on us. When we got over there via monorail and ferry ride, the Magic Kingdom was swamped with people. Luckily rides weren’t the top priority of this particular trip – it was more about soaking it all in again (it’s been at least ten years since I was last at Disney – at least! ), seeing everything that’s changed (or I’d just forgotten since I was much younger last time) and most importantly, hanging out with Jenny and Terry. The lines for the People Mover and the Haunted Mansion weren’t unbearably long, so we rode both of those rides and spent most of the rest of our time wandering around from one part of the park to the next. I marveled at how in to Disney some people were with full-on polyester costumes, wigs and makeup to imitate their favorite Disney character (even in 90 plus degree weather). That was dedication! After taking some obligatory pics with Cinderella’s castle in the background (one of which is currently my profile picture), we were all four of us done in and made the (much less crowded) ferry and monorail ride back to Epcot where the car was parked. I know this shot is a little dark, but it’s still one of my favorites for obvious reasons. I should note however, that Terry is a notorious night owl, so instead of passing out at 1 AM when we arrived home, we watched a couple DVR-ed episodes of “Duck Dynasty,” the most ridiculous show ever created. Then I fell asleep out after a quick shower an hour later. Wow – what a first day at Disney! Stay tuned for more in my next blog when we hit the animal kingdom, Hollywood Studios and Downtown Disney! What a weekend this was gonna be! 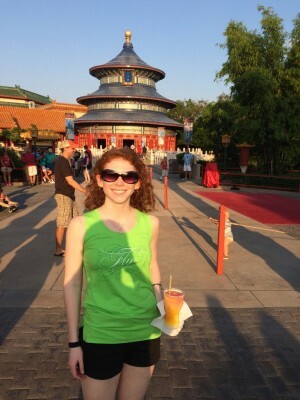 This entry was posted in Florida, North America, United States of America and tagged Disney, Epcot, Florida, Memorial Day, North America, Orlando, Raw Threads, Travels, United States of America on July 17, 2014 by Paige N..